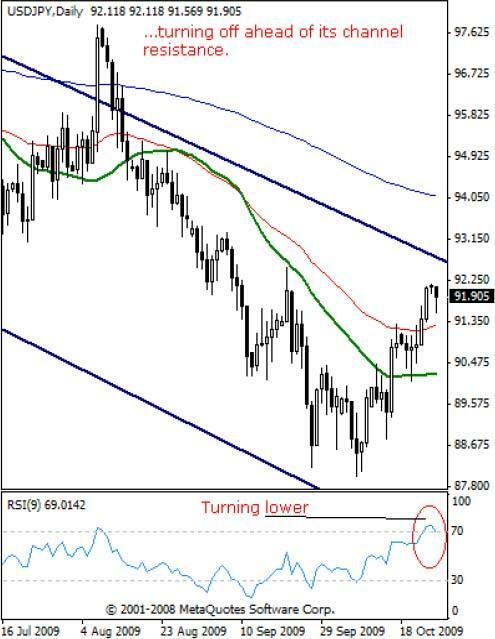 USDJPY: Channel Top To Provide Resistance - Outlook for USDJPY though nearer term higher, is largely bearish short and medium terms suggesting its current recovery. USDJPY – Outlook for USDJPY though nearer term higher, is largely bearish short and medium terms suggesting its current recovery is corrective of its declines triggered off the 101.43 level in April’09. More evidence of this view is provided by its falling channel patterns both on the weekly and daily charts and the immediate risk is for that channel resistance currently at the 92.70 level to be tested and eventually turning off the pair. We have seen USDJPY even backing off ahead of the mentioned level today providing early signal of how important that level is. The 92.70 level is also within the vicinity of another resistance standing at its Sept 24’09 low at 92.52. Downside threats are now seen towards the 91.31 level, its Oct 16’09 high and then the 90.44 level, its Oct 12’09 high which is expected to reverse roles as support. Below there if seen will bring the 88.82 level, its Oct 14’09 high into focus with a break and close below that level targeting its Oct 07’09 low at 88.00. Conversely, to void our downside view, the pair must break and hold above its two channels thereby neutralizing its short term downtrend and creating scope further upside towards its Sept 07’09 high at 93.29 and then the 95.05 level, its Aug 24’09 high.On the whole, although USDJPY maintains a bullish tone nearer term, its broader bias remains lower in the shorter to medium term.